Lonza is one of the world's leading suppliers to the pharmaceutical, healthcare and life science industries. Lonza established a Knowledge Transfer Partnership (KTP) with IT Innovation and the School of Chemistry at the University of Southampton for assistance in deploying a commercial electronic data management and execution solution across their business. 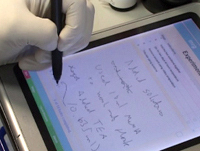 Following extensive analysis and design work, tablet computers running software from IDBS, a global, independent, data management, analytics and modelling software provider, are being deployed at Lonza. The tablets run IDBS' Bioprocess Execution System which stores all data produced during the laboratory process in-house. IT Innovation provided expert knowledge in resolving specific technical challenges on integrating system components with the holistic system, structuring data and meta-data for good management and retrieval practices, inputting know-how to the business processes design used for 'define-create-test', as well as ad hoc technical support. This work continued IT Innovation's long-standing collaboration with the School of Chemistry in the e-Science domain, and provided an opportunity to explore the differences between academic and commercial laboratory practice and how that affects the requirements and constraints on the underlying IT solutions. The Lonza KTP project was a 37 month project that started October 2010. The Lonza KTP was supported by funding from the UK Technology Programme.